Video gamers' desire for more realistic graphics has produced more than just flashy new games; just ask a computational chemist. Theoretical chemistry involves using the principles of physics to explain and predict chemical reactivities. Computational chemistry takes the results of theoretical chemistry and pipes them through computer programs in order to calculate the properties and structures of solids and molecules. That takes a great deal of computing power. The past three years have seen a rush of data coming from computational chemists, and it's all thanks to our need to shoot realistic three dimensional people in the face. Computational chemistry owes a great debt to the graphics processing unit, or GPU. traditional central processing units (CPUs) in computers only contain a handful of computational cores used to provide arithmetic functions. 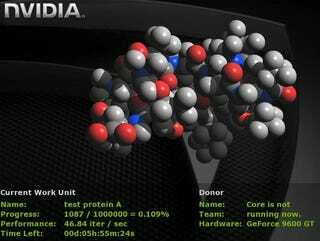 GPUs, on the other hand, contain hundreds of arithmetic elements, which makes them perfect for performing the advanced calculations necessary to do things like folding proteins. Sony PlayStation 3 owners who've participated in the Folding@Home project have seen the power of their GPUs first hand. GPUs have been around for ages, but using them has traditionally been a hassle. "In those early days, you really had to represent your calculation as if it were some graphics operation," says Vijay S. Pande, a chemistry professor at Stanford University. In other words, theorists had to jump through a lot of hoops to get the GPUs, which were set up to output shaded polygons, to recognize their algorithms. that all changed in 2007, when NVIDIA introduced the Compute Unified Device Architecture (CUDA), which allowed researchers to access a GPU's higher functions using traditional programming languages. Since the introduction of CUDA, other graphic chip manufacturers like AMD have introduced more user-friendly chips as well. How much of a difference does a GPU make? Adding two GPUs to a cluster named Lincoln at Illinois' National Center for Supercomputing Applications sped up a simulation of the ribosome's production of a polypeptide and its subsequent threading through the translocation channel of a cell membrane four times, reducing the time required from two months to two weeks. All this power because gamers wanted to look at pretty pictures. Never say we didn't give you anything, science! You can read more about the GPU's contribution to science in Laura Wolf's "The GPU Revolution" article at Chemical and engineering News.